Shawn said something to me the other day that really inspired me to keep dressing fancy and being myself, even now that I’m a mother. I was really tired yesterday and didn’t want to get ready…At all! I was in a blah mood and somewhat depressed mood. I just wanted to sit in my pajamas with my messy hair pulled in a scraggly ponytail and watch movies. Once in a while it’s fine to have a chill day but to be honest, it had been a few days that I had been like that. It’s not like me want to sit around and not care about getting ready and presentable…not me at all! I had mentioned earlier that month to Shawn that I hoped Everly would enjoy many of the things I liked. 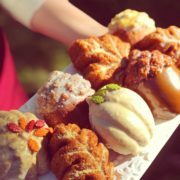 Such as ballet, French pastries, reading novels, history, and traveling. Yesterday Shawn reminded me of this and lovingly said, “Remember, Everly is watching now to see how you act and what you do day-to-day. She wants to be just like her mamma and I’m guessing she will follow in your footsteps”. That’s when I realized that I always want to be my best for her and I hope to inspire my Everly Verina Belle to be her best! The next day I got dressed up in pearls and heels and took Everly for a stroller walk downtown to see the changing leaves. She absolutely loves to be outside and loves going on adventures with momma and daddy. On walks I show her my favorite flowers and let her touch and smell them. She usually tries to eat the petals, but I figure one day she will love them like I do, haha! 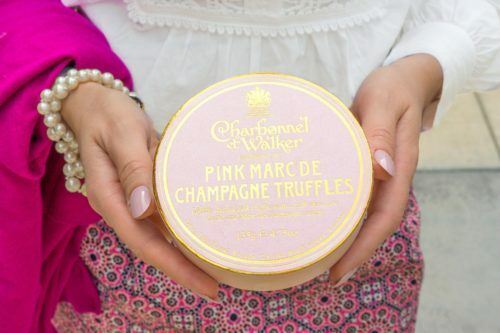 It was a wonderful walk and I had my favorite Charbonnel et Walker Marc de Champagne pink truffles as a snack. It felt incredibly good to be outside in the fresh, crisp air, enjoying mother nature! I’m so happy to have such a handsome and caring husband! We’ve been together for almost thirteen years and it’s very safe to say that he truly knows me. He knows that getting dressed up fancy makes me feel happy and inspired. Love you Shawn! 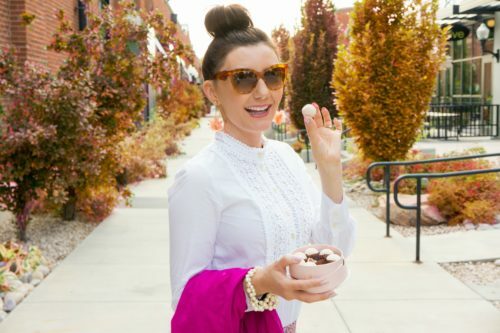 « Biscuits, baby and a beautiful autumn day! I’m obsessed with your pink skirt! So cute! This outfit is so feminine and classy, love it! I love that skirt! Those chocolates are some of my favorites! So good! 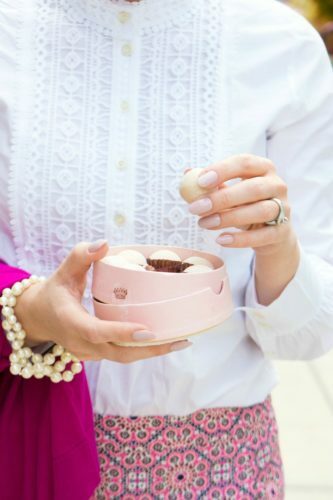 These truffles look so yummy! And I am loving all of this pink, your cardigan is so cute. Thank you so much lovely! I’m glad someone else understands! I hope you have a wonderful fall day! Sometimes you gotta dress up just for the heck of it. Also, those truffles look so delish! Champagne truffles?! Sign me up for some 🙂 Anyways, you always do the classic sophisticated style so well! That printed skirt is just gorgeous, and I really love how you slicked your hair back. Such a great job styling this look! love your cute tweed skirt! This look is soo adorable and I love your look. It’s giving me Gossip girl vibes! Those champagne chocolate are one my favorite!